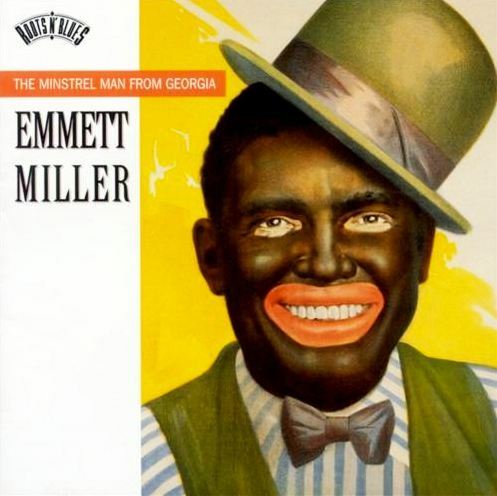 Of the surviving photographs of the minstrel Emmett Miller, one shows him in blackface, with a tight bowler tilted toward his left eye. He is wearing the too-broad smile of a clown. Miller’s fame+was short-lived, peaking in the mid-to-late 1920’s, when he made a handful of commercial 78’s, and on the wane by 1930. Miller was briefly promoted as the ”Famous Yodeling Blues Singer” before being eclipsed by ”America’s Blue Yodeler,” Jimmie Rodgers. In the 1930’s Miller dropped into obscurity, working in tent shows and cheap joints, his face still smeared with burnt cork. He died of esophageal cancer in 1962, after surviving for years on the kindness of family, friends and barroom strangers.